Asphalt Paving Contractor in Houston, TX. We are your asphalt paving and repair solutions for every paving need that you may face. We are experts when it comes to paving and pride ourselves in being your full-service contractor for the entire Houston Metro area. We actually service the entire State of Texas, so if you have stumbled upon our site go ahead and give us a call as we would love to provide you with a free quote for your paving project. We do service both residential and commercial clients. No matter if you have a single pothole that needs to be repaired, or if you need a new construction asphalt parking lot, we are ready to assist. There is no job too small or too large for our crews to handle. We provide you with excellent customer care and look forward to working on your pavement projects. We use state-of-the-art equipment, the highest quality materials, as well as the latest paving techniques to install asphalt. We know that when we use top quality material and equipment, along with our skill and experience, we will be able to provide you with an excellent paved surface that will last. ​No matter the project you need to have completed, we provide a FREE no-obligation written estimate for the project that you need to have completed. Simply give us a call, or fill out the form on this site. We will schedule a time to discuss your project, and detail out the entire project agreement so we both fully understand the scope of the project, and so we can provide you with the most accurate quote. We specialize in all types of asphalt paving, repair, and maintenance. We know we work in a business where some paving companies have a bad reputation. It seems there are always a few sour apples that tend to give the good ones a bad name, but we are here to change the perception of paving companies. We service both residential and commercial clients. We are ready to tackle any and every project that comes our way. Here are some examples of the types of asphalt paving projects that we have worked on in the past. ​Asphalt pavement is the blacktop surface you are used to seeing on roadways, parking lots or some driveways. Hot Mix Asphalt, (HMA) is a mixture of stone, sand, or gravel that is bound together by asphalt cement. Asphalt cement is a product of crude oil actually, thus giving the black coloring. The asphalt cement gets heated and then combined with the aggregate at an HMA facility. The hot mix is then transported via trucks to the job site to do the actual paving. Once we place the asphalt in place, large heavy rollers are used to compact it into place. Once the pavement cools off you are able to drive traffic on the surface. In order to maintain the integrity of your asphalt surface, you should keep the asphalt well maintained. If proper maintenance is not performed, you will eventually see and experience a breach in the pavement surface which will result in a need of an expensive repair. As with any structure, maintenance always seems expensive until you realize that proper maintenance could have easily doubled the life of your original investment. If you do have damage like a pothole, we can easily fill potholes, but that is only a temporary solution to a much bigger problem, and at some point, we will need to properly fix and repair the asphalt surface. We can also repair cracks, but depending on the size of the cracks, there may be only so much we can do without needing to do a full pavement repair. Once we come onsite to look at your project, we can advise you with the proper repair for the damage you m ay have. Asphalt Milling, or Resurfacing as it may be called is the process of removing the top layer of asphalt and replacing it. The asphalt pavement consists of two layers, there is a base layer made up of larger stones and asphalt mix and provides strength for the pavement. The top layer is made up of smaller stones in the asphalt mix which helps make it less porous to help prevent water infiltration of the pavement. Since the top layer is not as strong as the base layer it typically will deteriorate first, resulting in the milling or resurfacing as being a great option for repair. ​An asphalt overlay is basically a patch job that is done when the surface has some damage but doesn’t need an actual full repair. If your asphalt is showing signs of cracking or potholes in spaces then an overlay may be an option you consider. With an asphalt overlay, we will come lay down a thin layer of hot asphalt on your existing surface, giving you an entirely new surface. The issues are that this overlay will not actually fix any of the underlying issues such as cracks, which will eventually crack through to the new service in a couple of years as well. So this is a short-term solution, and we will discuss with you all of your pros and cons for any type of solution that is chosen. Most people love tar and chip surfaces because they are very economical, way more affordable, and a perfect alternative solution to a typical hot mix asphalt blacktop. 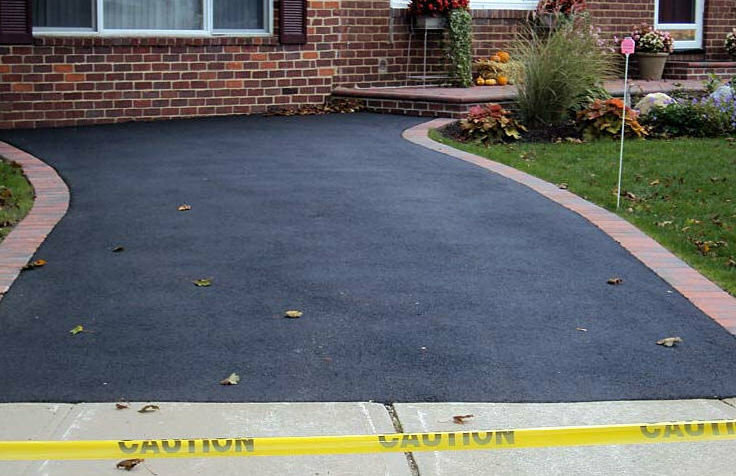 Tar and chip are great for both roads, driveways, and parking lots. The tar and chip paving method has been around for hundreds of years, and is very durable in all types of climates, and does extremely well in the Houston area. The tar and chip method is mixed right on site and is applied in two different layers. First, a hot liquid tar is laid down on the prepared surface, and then the gravel is applied on top of the tar. The gravel will become embedded into the tar as it is laid, and then we actually use a roller to firmly embed the gravel deeper into the tar. Some of the gravel will stay loose on the top, which is great for traction for your vehicle. The end result is an extremely durable surface that will last for many years to come. People love the tar and chip method for their driveways because they can actually choose the type and color of the gravel that is used. This makes it very easy to coordinate the driveway with the exterior of the home, or the surroundings. In order to properly maintain and get a long lifespan out of your asphalt surface, you will need to have a sealcoat applied as a part of your maintenance schedule. We understand that no one really likes the thought of having to do maintenance, especially on a parking lot or driveway, however, just like any other type of structure if you do proper maintenance you can expand the life expectancy of the surface to nearly double. The good news too is that you will actually spend less money on the maintenance over time than it will cost for a very expensive asphalt repair or resurface. Sealcoating is an actual protective barrier surface that is applied to the top of your asphalt surface. The sealcoat is a liquid coating that not only acts as a barrier but also seals the asphalt to help weatherproof and keep moisture from seeping through cracks down to the base layer. If your asphalt surface has larger cracks, we will need to fill and repair those prior to sealcoating. It is important to understand that the sealcoat top layer and the asphalt base layer are both wearable surfaces. As vehicles drive on the asphalt, and tires roll and turn on the asphalt it does wear down the surface over time. Once a sealcoat is added that top layer will be the wearable surface that will get worn down from vehicles driving on the surface, thus saving the asphalt base from damage. In comparison, asphalt is very expensive and sealcoat is inexpensive, so it is best to save and prolong the life of your asphalt by applying the sealcoat. It is recommended that when a new asphalt surface is laid that you do not apply the sealcoat for approximately one year. After that time you should have a seal coat applied, and then properly maintained and reapplied every 2-3 years. Not only does it prolong the life of your asphalt, but you will make the parking lot, roadway or driveway look brand new again. It is a win, win situation. We are considered a full-service asphalt paving company, so if we come in and lay a brand new asphalt parking lot for your business, or if we do some maintenance like resurfacing or sealcoating, you will need to have your parking lot striped. We have been striping as long as we have been paving, and our experience is top-notch. We use the highest quality paint materials, and equipment to ensure the lines we paint are consistent in width, thickness, and color. Our experience also allows us to paint the straightest lines in all of Houston. We are expert driveway paving contractors, specializing in both Hot Mix Asphalt, and tar and chip install. If you are in need of a new driveway, we are ready to assist you today. We have installed many different types of driveways and there is no project too large or too small. When you live out in the country there is nothing more satisfying than seeing the deep rich color of the blacktop surface pavement leading back to your property from the main road. There is a sense of pride you feel as you pull on the professionally constructed driveway, and know that you have made a great investment in your property.